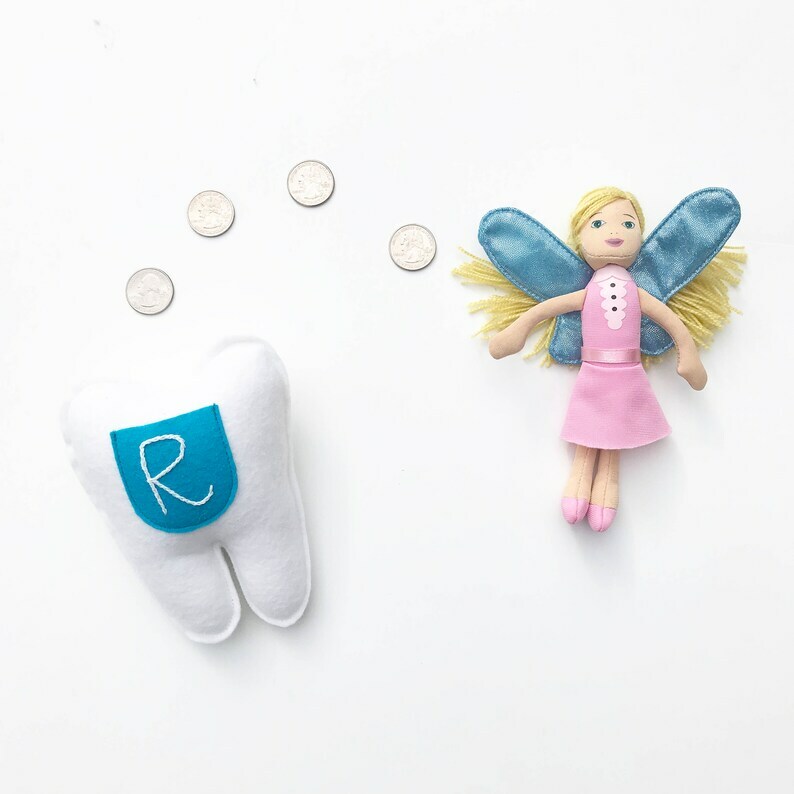 When little teeth get wiggly, it's time to prepare for the Tooth Fairy's arrival! 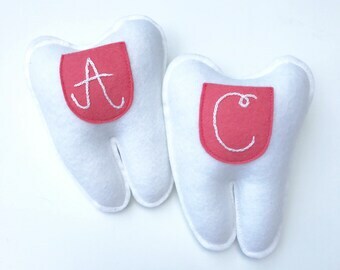 Keep baby teeth safe until pickup time with this pocket tooth pillow, specially made with your child's initial and shaped like a tooth so the Tooth Fairy knows it's for her. Each tooth is made from start to finish by me: the tooth and pocket are scissor cut by hand, then embroidered with needle and thread using the letter of your choice. The tooth measures approximately 6 inches by 4 inches and the pocket comfortably holds a dollar bill or coins (pocket is approximately 2 x 2 inches). This listing is for a tooth pillow with a cyan-colored pocket, shown on the featured photo. The default thread color is white. If you wish to have another color thread, please specify it in the Notes to Seller. Photo #5 courtesy of Benzie. Once your package leaves my hands, I no longer have control of how long it takes it to make it to its destination. Shipping times provided by the USPS are averages. Personalized Tooth Fairy Pillow. Periwinkle Pocket. Personalized Tooth Fairy Pillow. Julep Pocket. Personalized Tooth Fairy Pillow. Magenta Pocket. Personalized Tooth Fairy Pillow. Peony Pocket. Personalized Tooth Fairy Pillow. Peacock Pocket. Personalized Tooth Fairy Pillow. Aqua Pocket. Personalized Tooth Fairy Pillow. Clover Green Pocket. Tooth Fairy Pillow. Custom Embroidered Monogram. Custom Color Option. Holds Baby Teeth for the Tooth Fairy. Thank you for making this special for me. My grandson is going to have to wait a few years before he can us his but glad to get one of the last ones. Plush Tooth. Tooth Fairy Pillow. Holds Baby Teeth to Put Under Your Pillow. Custom Color and Initial Option. Tooth Fairy Pillow. Chartruese Green Pocket. Custom Color and Initial Option. Holds Baby Teeth to Put Under Your Pillow.